Among all of the new styles of cuisine popping up across Georgia, the classic burger remains a staple. 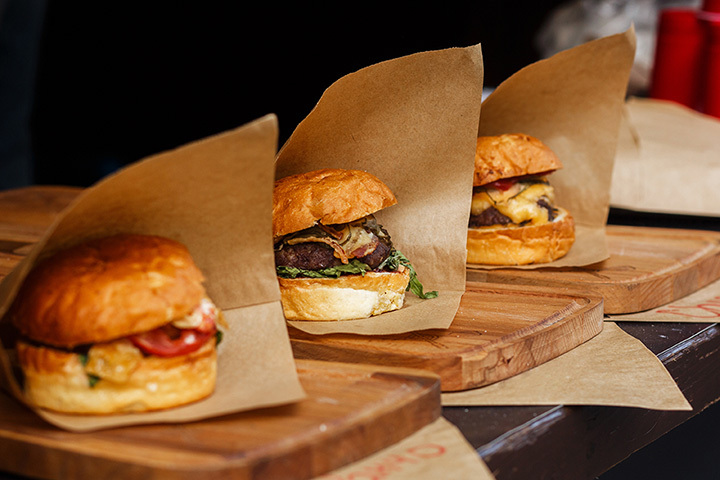 From unique topping options to a variety of bread choices to oversized portions and more, burgers are quickly becoming one of the most versatile menu items. No matter how you make it, the burger remains on the top of the favorite foods list, and you can find the best ones at these 10 best burger joints in Georgia. The vintage, silver-screen vibe isn’t what you’d typically expect from a burger joint, but rest assured the flavor is everything you could want. Every burger is cooked fresh to order, giving you the choice of beef, turkey, or chicken. Build it just the want you want with classic toppings or premium favorites, like jalapenos, fried pickles, or spicy pimento cheese. Their menu is action-packed with other tasty classics, and don’t forget to ask about their secret menu items! These burgers have earned the seal of approval from locals and vacationers alike. Their full suite of specialty burgers are unlike any other. Chorizo and lamb patties, fried salami, poutine, carrots, sauerkraut, and jalapeno crema are just a few of the oddities you’ll find on the menu. It’s an adventure in eating you won’t soon forget. This friendly neighborhood joint is famous for its craft beer and burger pairings. Everything is handmade in house, from ketchup and salad dressings to hand-pressed patties, and they source local ingredients and supplies to bring you an authentic farm-to-fork experience that also supports the local community. Their mission is strong, but their burger flavors are even stronger. The Rookery has enjoyed a long-standing history in one of the state’s biggest metros. Their award-winning burgers keep the place full, featuring items you just don’t find on most burger menus. Must-try items include their Coca-Cola ketchup, sriracha mayo, or their special Jimmy Carter burger that features peanut butter and Applewood smoked bacon. Some folks agree that no burger is complete without a frosty shake, and Farmhaus Burger is serving the best of both. This locally-sourced eatery knows how to make a high-quality burger that not only tastes good, it’s also good for you. Pair it with a spiked milkshake to complete the experience. The classic American diner gets a modern twist with a menu that features organic, local ingredients. You’ll appreciate the freshness and attention to detail in these carefully-selected menu items, especially when it comes to their burgers. Get your burger however you like it, or opt for another creative specialty burger, like the delectable Blackberry Bacon Jam Burger. This local, four-location (Athens, Atlanta, and Decatur) chain has everything going for it: contemporary ambiance, boozy shakes, and the best burgers in the Atlanta metro. Guests can indulge in B-movie films projected on the walls as they dig into their meals, which in itself is worth the trip. Locals know it as THE place for the best turkey burgers, and it will change everything you thought you knew about this twist on the American classic. Aside from having the best burgers in town, they’ve also got the best prices, giving you huge flavor for a low cost. Fresh beef and a dedication to quality makes Yonah Burger worth the trip. Their burger menu’s simplicity allows them to focus on building the best-tasting burgers in the area. It’s also the only local place you can grab a tasty turkey burger. With three Georgia locations, this trendy burger bar might be more than you can handle. The portions are large, giving you the most for your money, but you won’t want to stop until the last bite disappears. They’ve thought of everything to make your burger experience unforgettable, from toppings and meat choices to health-conscious options.